Do you have a Holden car? Is it always breaking down? Or have you simply grown tired of it, and want to get a new car? Don’t sell your car the old fashioned way. You will have to wait weeks, and you may not even get the right price for your Holden. Therefore, if you want to sell your Holden via the fastest method that there is in all of Sydney, contact us here at Wreck Monster! Contact us for a free quote by calling us at 0478 682 103 or 0401 333 393. If you would prefer to get a free quote by filling out a quote request form, as luck would have it we have one of those on the front page of our website. It is displayed in a prominent position so you can’t miss it! We are proud to be Sydney’s leading auto dismantlers & recyclers. With this in mind, we would like to introduce ourselves as the most responsive and reliable of all your local cash for cars companies. If you want to sell your Holden without all the normal hassle and stress, you would be well advised to choose us to sell to. We pay only the most cash for all kinds of Holden vehicles. You might be thinking that we only buy cars, but that couldn’t be further from the truth! We buy automobiles of all types, including cars, vans, 4×4’s, trucks, SUV’s or Utes. Are you wondering to yourself, “what is the best place to sell my car in Sydney?” Well, wonder no more. You have found the best place. That place is Wreck Monster! We often get asked all kinds of different questions concerning our services. One of them is whether there are particular Holden models that we don’t buy. The answer to this question is simple. We buy all Holden models. In addition, as an Australian buyers of old vehicles, we love to buy all kinds of Holden models and pay top cash for Holden Commodore, Cruze, Rodeo, Adventure, Jackaroo, Barina, Kingswood, Berlina, Epica, Caprice, Torana, Colorado, Camira, Shuttle, Calibra, Astra, Frontera, Belmont, Suburban, Premier, Zafira, Captiva, Sunbird, Viva and Calais etc. Hence, there isn’t a Holden model that will be any kind of obstacle in your mission to sell it. So looking for the Holden Wrecking or scrapping yards in Sydney? Get in touch. Normally, when you sell a Holden to a company such as ours, you will be asked to pay for the removal of said Holden yourself. Here at Wreck Monster, we believe in providing a free car removal service for folk whose vehicle is in no condition to drive. 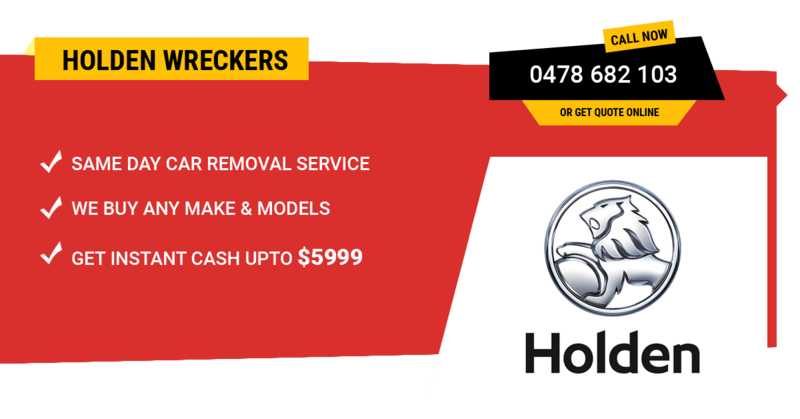 Get Free Holden Car Removal in Sydney, NSW. We cover the whole Sydney area, and all immediate suburbs including Campbelltown, Penrith, Greenacre, Blacktown, Richmond, Baulkham Hills, Liverpool, Ultimo, Parramatta, Botany, Smithfield and much more. We always notify everyone, please verify your location if you are looking for the same day auto removals services because in some of rural locations, it is really hard to offer the same day removals. Furthermore, we pride ourselves on our habit of only paying the most cash for cars that we can. If you need to sell your Holden, and you are worried that you won’t get the full value that it is worth, selling to us should set those worries to bed. Get top cash for Holden vehicles. The final price varies according to the age and the condition of the vehicle, you can get up to $100 to $15’000 cash for Holden vehicles. If you get a better offer from one of our competitors, tell us and we will match it. If you are concerned that your Holden is in a condition that will prove to be a major hurdle in selling to us, put your concern to rest. There is value in all automobiles, regardless of what condition they are. We will buy your Holden whether it has been in a crash, flood, fire, unregistered, broken or accident, or has simply gotten older. Does your Holden need to be repaired? Don’t worry, as it is normal for a vehicle to need repairs from time to time. However, if you are about to get brand new Holden parts with which to make those repairs, buy second hand parts instead! They are much more affordable and are often just as good as brand new parts. Get the massive range of second hand Honda parts and accessories in Sydney, NSW. Because we get so many cars through our scrap yard on such a regular basis, we have amassed a giant range of Honda parts. It is a veritable smorgasbord of parts for folk who are in great need of them. We sell parts for Honda cars, trucks, vans, 4×4’s or all commercial vehicles. All of our auto spare parts are fully checked and ready for sale. They are both affordable and in great condition. Get the parts with a limited warranty and make the satisfactory purchase. Get in touch with our Facebook page because most of times, we have the old Holden parts for sale online. Finally, selling a Holden car in Sydney? Just make a call at 04 01 333 393. Fill up one of free quote form on the website and you will be assisted as a priority. We provide the easiest and fastest method of selling a vehicle in all of Sydney. The level of stress and hassle you will encounter when selling via the normal avenues far exceeds the levels you will experience when you sell to us. If you would like to explain about the vehicle’s condition and the vehicle’s VIN number. That would be really helpful to us to fetch up the correct valuation for your Holden car. You will be pleasantly surprised!